If you're planning to say I Do in style, and nothing but royalty can fulfill your desire, then a Destination Wedding In Rajasthan is your *literal* one key solution. The land of cultural and traditional vibrancy- Rajasthan, offers few of the most exquisite and opulent venues to tie the knot. 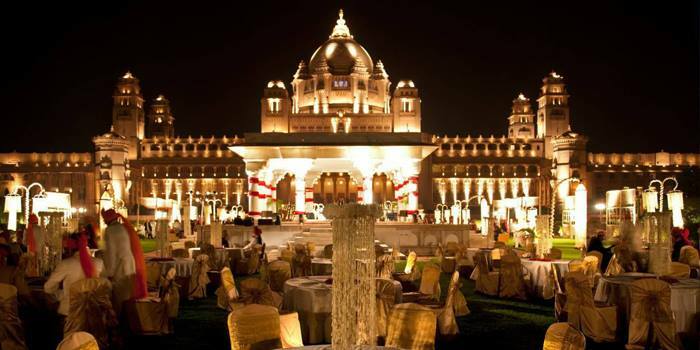 And undoubtedly, our personal favourite is The Umaid Bhawan Palace, Jodhpur. Managed by the Taj Group, this mesmerising yellow sandstone monument is spread across 26 acres of lush land and also makes to the list of one of the world’s largest private residences. Located at the edge of the Thar, a Royal Wedding In Jodhpur’s Umaid Bhawan Palace is a juncture for splendour and marriage. The magnificent architecture inspired by the European and Western style and staggering lavish interiors following the Deco Art Style exude flamboyance and extravagance all over! The Umaid Bhawan Palace offers 4 top-notch indoor venues and 6 splendid outdoor venues to exchange the vows. Accommodation: This grand venue has a total of 67 rooms with 30,000 - 35,000 INR per night. Food: The Umaid Bhawan Palace offers a spectrum of mouth water delicacies from the Indian and international kitchen leaving your guests with an unimpeachable zing of flavours! If you're planning a Palace Wedding In Rajasthan with a guest count of about 200, then the Umaid Bhawan Palace is your match made in heaven! But this is how much it may cost you. However, the above mentioned stats give you an estimated total of your accommodation and food expense at The Chunda Palace, there are few more nuances you've to keep in account. Mandap : Set up your mandap at this royal palace according to your theme. Tables & Chairs: It’s advisable to have a count of the guests for making proper seating arrangements. Aisle: Decorate your aisle with dazzling props and make it nothing less than dreamy. Center Pieces : Elevate the aura of your event by positioning captivating centre pieces. Stage: Browse through the plethora of options and select the stage according to the theme of the event. Dance Floor: The way to celebrate is through dance, so it’s requisite that you arrange for a dance floor as well. Lighting : The golden palace looks stunning in the subtle hues of amber. LEDs : Add a little frill and extravagance to the night by adorning it with dazzling LED lights. Flower Decor : From mandap to stage, elegant flower decor is a must! TRANSPORT & LOGISTICS: Having a transpiration team on the go is important to avoid any kind of hustle! PHOTOGRAPHY: Hire a professional photographer with the ability to capture the essence of the royal Rajasthan as well as your precious moments perfectly! SOUND AND DJ SETUP: Inform your DJ about your taste in music pre hand! MAKEUP & MEHNDI ARTISTS: In order to avoid any last minute hassle, it is advisable to pre-book your makeup and Mehndi artists. FOLK ARTISTS: Arranging some performances by the local group can make the event more lively as well as engaging.